IRON COUNTY — Utah Highway Patrol arrested a 25-year-old California man for possession of multiple drugs, driving under the influence, speeding and failure to register a vehicle after he was pulled over for a traffic stop on Interstate 15 near milepost 99 Monday night. Late Monday night, UHP trooper Bambi Baie stopped Daniel Peng, of Bellflower, California, for going 109 mph in an 80 mph zone near a ranch exit just outside Beaver County. Inside the vehicle, Baie said she located marijuana, hash, mushrooms, acid, DMT, hydrocodone, methylphenidate and other prescription medications without a prescription bottle. Multiple marijuana pipes, bongs and other paraphernalia were also found in the vehicle, Baie said. A urine test conducted at Baie’s office following the arrest came back positive for THC. 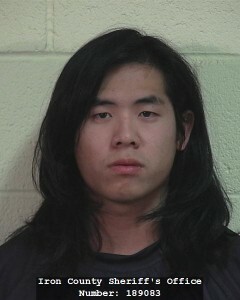 Peng was booked into the Iron County Jail on five counts of possession of schedule 1 and 2 drugs, all third-degree felonies; possession of schedule 3, 4 and 5 drugs, class A misdemeanors; possession of marijuana and drug paraphernalia, driving with a measurable controlled substance, no proof of insurance and speed regulations, all class B misdemeanors; and failure to register vehicle, a class C misdemeanor. Peng was held on $5,000 bail but has since been released from custody, according to current bookings information. Over a 100 mph While holding substantial quantities ? I’m shocked this idiot made it to 25 and wasn’t in jail already ! No kidding, whenever I transport narctics I keep it within 5mph of the legal limit. WOW!!! 109, 80 wasn’t fast enough. Simply trying to keep up with other traffic! Hope she used her pink handcuffs on this jerk. Thank goodness this individual was apprehended with that load of illicit pharmaceuticals. There seems be an over abundance of “unlicensed pharmacists” showing up in these parts lately. Kudos to Officer Bambi. Out on the street already? Probably had to get up to SLC city and haul a load back to So Cal. If he ever has a bachelor party, maybe Officer Bambi could come back and re-arrest him for being a naughty boy. Seriously though, glad the officer stopped this freak before he killed someone. PARTAY!!! Are the Grateful Dead touring again? Utah has a trooper named “Bambi” ? That’s the most interesting part of this story. Yes, and she is a real Dear! Does it bother you that the govt. pursues druggies more than church people? What happened after he was released with such a small bail? Did he still have a driver’s license? Did he get the car back? Is he a danger to other people? We need follow-up to this story.